This Wonderful Lamp Has Been Sold. A Rare Navigation Light for a Larger Ship! DIMENSIONS: Lamp not counting bail, 17 1/2" high Diameter of 10”. PRESENTED is one of the largest kerosene ships navigation lights made by the iconic Perkins Co. that you are very unlikely to come across. Anthony Hobson, in book two of, “Lanterns That Lit Our World“ illustrates this light on page 103 and says that it was made for twenty years starting in 1916. They were available in clear, red, blue or green Fresnel lenses. An internal hurricane chimney was not necessary. Note the two rings on each side of the lamp which acts as guides to raise and lower it for fueling which lasted about eight days. This dates the lamp to sometime after 1931 when when the company's name was changed to Perkins Marine Lamp & Hardware Corporation and to 1936 or earlier when this lamp was discontinued. PERKINS' BRIEF HISTORY: Starting in 1904, Perko made all kinds of lights under their original name, "Persky". In 1916, they incorporated under the name Perkins Marine Lamp Corporation in Brooklyn, NY. This same year the PERKO trade mark was adopted. In 1931 the name was changed to Perkins Marine Lamp & Hardware Corporation. In 1961, the Brooklyn facilities were closed and operations were moved to Miami, FL. Perkins was dropped from the name and the company became known as PERKO Inc. 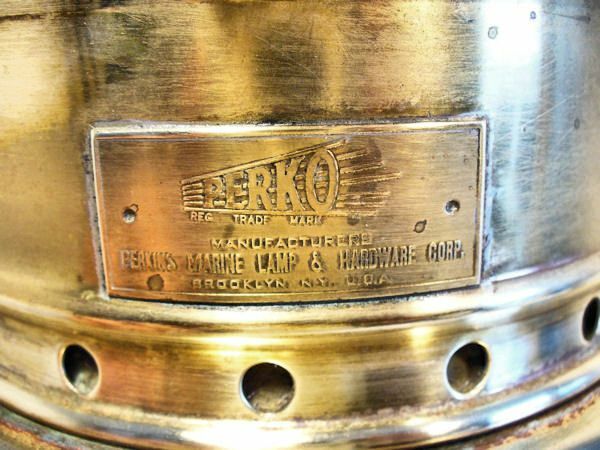 It was in 1916 that the Perko trademark was registered, and it has been used ever since. The company still makes high quality marine lights and hardware out of its Miami, FL facilities. This is the largest anchor light by this maker that we have seen. Old fashioned Turn of 20th Century styling. CONDITION: Except for the flat spot near the back which is mostly not visible, this lamp is in very good condition with only the usual minor marks of age from use at sea. The Fresnel lens is perfect. The original kerosene burner resorvior is stamped PERKO on its bottom. 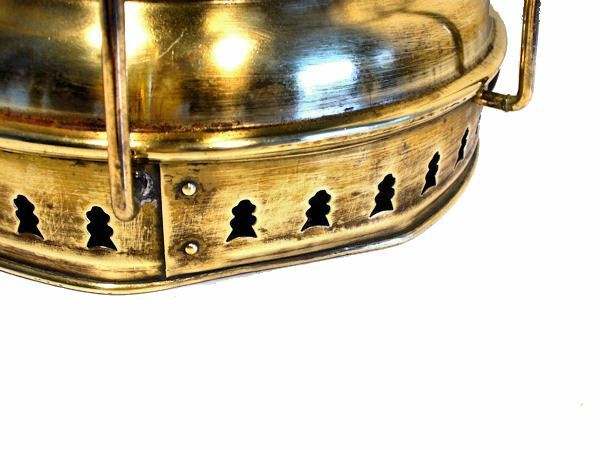 This lamp is very scarce and should appeal to most collectors who are looking for something different. 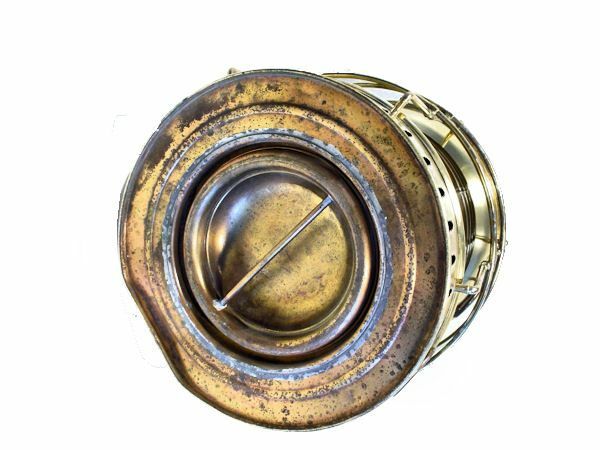 To view our current inventory of vintage and antique fine ships navigation lamps, click here! CONDITION: Except for the flat spot near the back which is mostly not visible, this lamp is in very good condition with only the usual minor marks of age from use at sea. The Fresnel lens is perfect. The original kerosene burner reservoir is stamped PERKO on its bottom.